I’d like to start this month’s update by saying a big thank you to everyone involved in the changes to the MOT that came in last month. It’s been really positive to see how much effort you all put into preparing yourselves for the changes. It meant that the majority of MOTs happened on 20 May as normal, giving the public the service they expect from us. There was also very few phone calls to our call centre from you asking for more clarity on the new MOT standards, which is great. Before 20 May, the training environment we set up to help you get used to the changes was used by over 12,000 testers. Your feedback showed that most of you found this useful, so we’ll look at providing a similar training environment again for any large changes in the future. Since then, we’ve been reviewing the test recording data to help us improve the service for you. The data showed us that it took some of you longer to record defects in the first few days after the changes which isn’t surprising. However, by early June the time taken to record defects quickly returned to about the same as it had been before the changes. We also saw a big increase in people choosing to ‘search’ for defects, because the structure of the new manual is not as familiar. This has given us useful information on what people are looking for but not finding, which helps us improve it. We’ve already added more similar words for common searches so when you’re searching for one word or phrase, it finds another in the manual that means the same. We received some feedback on defects that could be worded more clearly in the manual and in the standards. We’ve reviewed this and we’ll make some minor changes so that defect descriptions better match the defects you see on vehicles. Another big thing the team has been working on improving recently is risk rating. Risk rating garages is a really important area as it determines how we direct our resources to support garages and carry out enforcement activities. Why are we changing risk rating? Over the last few months, we‘ve been running some trials to see how we can better assess risk and focus our efforts more specifically than we do now. This will help improve MOT quality and catch more MOT fraudsters. The future overall risk score for a garage will be made up of 2 key elements – analysis of the data and the results of an improved site assessment. This information will help us develop an overall impression of the garage. This is the same data that testers and those that run garages can look at through the test quality information feature of the service. So, we’ll do some calculations based around testers and this will be pulled together to form an overall score for the garage. We’re working hard to make sure that this information is clear and open to those that need it. 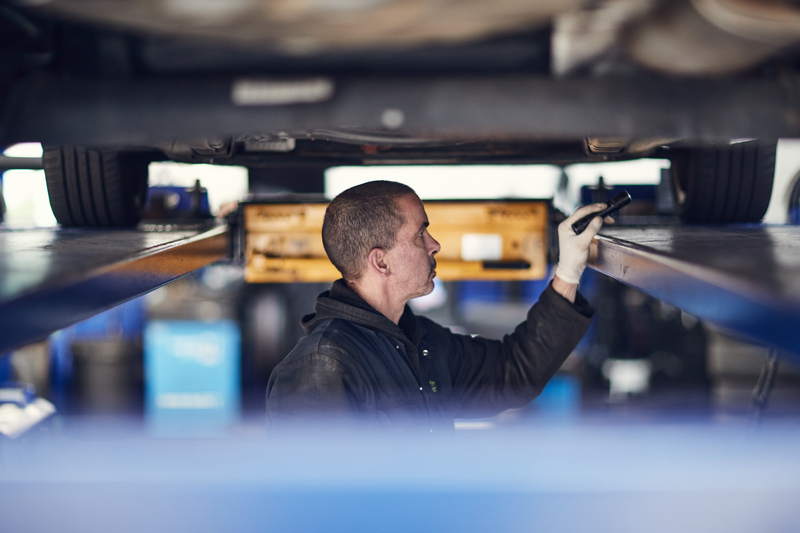 Vehicle examiners will still visit sites and carry out checks to make sure they comply with DVSA’s rules and that they have good systems for managing the quality of testing. We’ll aim to include a check of an MOT being done in this visit too. These checks will be done at fixed intervals, which will initially be every 3 years. We’ll look to make this more regular in the longer term. So, the overall risk rating will be created by combining the data and the site assessment. The garage will be given a red, amber or green rating, which will give us a clear view of where to focus our support and enforcement efforts. I’ll explain more about these changes nearer the go-live date in autumn. As well as refining our manual and standards following the changes to the MOT, and improving risk rating, we’re also working on some more smaller improvements. Over the next few months, we’ll be looking at improving the way security cards work, to make the system more secure and easier to use. We’ll be blogging more about this soon. As always, please let me know your feedback in the comments. It’d be good to hear how you’ve found the MOT changes. How do we fail uneven brake application (rise and fall) if both wheels lock eventually? ie. imbalance before both wheels lock on the same axle is say, 60%. "2. Gradually apply the service brake and watch how the braking effort for each wheel increases. Stopping short of lock up or maximum effort, hold a steady pedal pressure and check there is no excessive brake effort fluctuation with each revolution of the road wheel." "3. Gradually release the service brake and observe how the braking effort at each wheel reduces." "d. Abnormal lag in brake operation on a wheel." "For the majority of vehicles, the MOT testing service will calculate brake imbalance automatically. However, when this isn’t the case, such as for tricycles and quadricycles or if MTS isn’t working, you must calculate the brake imbalance against the maximum brake efforts on each axle in the following way:" Refer to Section 1.2.1 for the calculation. I hope the advice / information is of help. If the VIN PLATE is missing, not found, illegible or has obviously been tampered with, I can use any visible VIN to register a vehicle for test ie. the one in the windscreen or stamped somewhere on the body. But how do I check the GVW (for Class VII). If the above occurs (Twice last week) should I test the vehicle using one of the visible VIN and the fail the vehicle for no VIN PLATE. "When conducting a test on an roller brake tester (RBT) where more than half of the wheels of a brake system lock the efficiency requirements for that system are considered to be met." "Alternatively, the efficiency requirements are met if the front wheels lock on the service brake of an unladen Class 7 vehicle with at least a 100kg force at each rear wheel for a two-axle vehicle, or at least 50kg force at each rear wheel on a three-axle vehicle." "Vehicles of unknown test weight can be tested on either a RBT or plate brake tester (PBT). However, if the number of wheel locks aren’t achieved for any system on a non-ATL RBT, a decelerometer test must be used to establish the overall brake efficiency of the relevant system(s)." "If axle weights aren’t displayed on the manufacturer’s plate, you must assume that the load capacity of the tyres are suitable, unless there’s indisputable evidence to suggest otherwise." I hope the above advice/information is of help to you. I would refuse to test. You need the vin plate for axle 1 and 2 weights for class 7, which correct me if im wrong, arn't in the log book. I wouldnt use a reliable internet source just incase the vehicle has been modified in anyway and the vin plate altered accordingly. In Mike's query he is able to identify the vehicle as the V.I.N is displayed, so he would not be able to refuse to test the vehicle, because the vehicle manufactures plate is missing. "Vehicles of unknown test weight can be tested on either an RBT or plate brake tester (PBT). However, if the number of wheel locks aren’t achieved for any system on a non-ATL RBT, a decelerometer test must be used to establish the overall brake efficiency of the relevant system(s)." I hope this post gives clarification to Mike's concern and my approach to testing a vehicle without a manufacturers plate. Yeah good point, so maybe the question to ask is whats the difference between malfunctioning and obviously inoperative. Its either working, or it aint, there is no middle ground. Good luck on waiting to hear a response, ive asked lots of questions which havent been answered. Yet every time i try to get through to technical on phone it keeps cutting me off and a few minutes wait saying there is no one available to help. Were left out here on our own with no help / guidance or back up!! Vehicles first used on or after 1 April 1991 that are wider than 2,100mm must have their end-outline marker lamps inspected. Can i have a reply to this please. Tried to phone through for help but there is no one available and keeps cutting me off. If a vehicle is after 1991 and is wider than 2100mm does it have to have end out line marker lamps fitted. So if a caravan had rear ones fitted but not fronts (no evidence of ever being fitted) how can i fail it on missing, if it was never there? Or do we just check vehicles after 1991 and wider than 2100mm and inspect lights if they are fitted, or clear evidence they have been fitted. Can we have some clarity on this please?? There is no fail for headlamp switch. There is a minor for switching between dip and main beam, but not the actual switch you use to put the headlights on. There is a fail for sidelight switch, but not headlight. Can this be included please!!! when we leave the eu do we revert back to the old uk mot system dispsense with this overcomplicated arrangement and get a refund for the overpriced diesel update ?? Tested a Landrover Discovery today whos' main beam activated when signaling right. I struggled to get an accurate RFR and for the avoidance of doubt, had to embelish my reason with free text. Pre-20th, I would have used the 'lights interacting' thing (or whatever it said). This isn't how it should be in the name of road safety! (tyre valve) 'significantly deteriorated' needs to be re-included as an RFR; the old wording never covered it adequately and was prety much pointless. I think now everyone has had some time to get used to the new layout it isn't so bad just worded different and some things missing which will obviously need to be put back in. There are a few cases where the new wording I think isn't really appropriate. You have to look at the fails and advises sometimes from the point of view of the person reading it, i.e the service advisor and customer. Neither of these are often qualified technicians and often don't have much of a clue. Some examples : Tyre worn close to limit/worn on edge as one advisory. What if the tyre isn't worn on the edge? It puts it in anyway which is at best confusing for the customer but in worst case could be construed as dishonest after they have paid for an alignment they didnt need. Another is brake pipes corroded/covered in grease or other material. Which is it? Customer will ask, service advisor wont know then the whole operation looks unprofessional. Hi had a lengthy conversation with a fellow tester today regarding testing methods. The disagreement was due to the correct methods for checking exhaust systems for leaks. My fellow tester stated that as the testing manual has no mention of having the engine running when carrying out an exhaust condition test that having the engine running was not required. I have checked the manual myself (section 6.1.2 Exhaust system) and I can't find any mention of it either. But how can you check an exhaust for leaks if the engine is not running, can you please clarify as I'm sure it was mentioned in the old manual. It does mention having the engine running when checking for fluid leaks (section 8.4.1 Fluid leaks). 2. With the engine running, check the exhaust system for leaks. Hi Richard thanks for you input. Contacted my local area officer for clarification, who informed me that if he was carrying out a site assesment and saw a tester doing the underbody inspection without the engine running he would fail the tester. My argument is if the tester then asked to be shown where in the manual is says the engine must be running what would happen. In the old manual no problem, but with the new one no mention. Also as a tester of some 32years I think I have a good knowledge of how to carry out an inspection, can the same be said of the more inexperienced testers who could probably benifit from the guidance in the manual. We as testers should be testing in accordance with the manual and I think DVSA need to reinstate the method of testing and not the current setup. You won't be able to check the exhaust system for leaks if the engine isn't running. Diesel emission plate number. I've had a few cars where there is no plate number in a box on the chassis plate, but when I look else where there is a number in a box stuck to the body work , ie slam panel, inner wing etc. Now this may well be the emission plate number, but not where it should be according to the manual, so do I put plate number not found ? It would have helped if vehicle manufactures would have actually named it. Audi a7 ultra in for service and emissions check the exhaust probe would not fit in the exhaust back boxes. We will be re-introducing tyre valves shortly. A special notice will be issued in due course. Hi Simon could we not be compiling a data base of emission plate values for each vehicle as we go along ,I have had four vehicles in since May with plates removed or damaged looked deliberate .we can enter brake readings so could there be an entry box for plate values . Or could not the vehicle manufactures supply them to DVSA & then added to the system, I've had a few where the plate number in a box (I'm assuming its the plate number) is no where near the chassis plate (Renault,Peugeot, Citroen, I'm looking at you ) so I've got to assume its not available as the number could be for anything. Just had a car where the number plate lamps clearly were not illuminating the number plate. Manual says that they have to but there are no rfrs to fail on . Cracked isn't broken! your understanding of definitions in the English language is sadly lacking. Can we please have clarification on the new diesel emission limits, when using the limits displayed on the vehicle, can we only use the limit if it's displayed on the chassis plate or can it be displayed anywhere? Also as I've asked before and still not had clarification, if a car fails on the specific plate limit then comes back for a retest with it covered or scratched off do we then revert back to default limits? Limits can be displayed in an alternative position, not just on the chassis plate. The limits could be on a sticker/plate under the bonnet and may have R 24 on it. If the vehicle is represented with the plate removed, the tester should still retest to the same plate values as that information is still available and relevant. why were many comments deleted or left un answered on the previous blog post? I raised multiple omissions from the bike test that were not answered. 1. a tight chain is no longer a fail or advise even thought its just as dangerous as a loose chain? 2. Corroded exhaust is no longer a fail or advise. Only if its leaking or about to fall off! 3. handlebars trapping riders hands on full lock has been removed. 4. locking devices such as split pins missing on wheel spindles or brake stays are no longer a fail? just a few of the omisions we were not told about. no special notices or anything! just go read the manual.. very unprofessional. Why have you not included rubber bush Deteriorated/Deterioration as bonded bushes do not tend to wear they Deteriorate/Delaminate. Anyone else having problems were the page keeps skipping down every time you remove a repaired item from the list ? Its annoying to say the least. Also with regards to the engine malfunction indicator lamp (MIL). I've had 2 vehicles since the introduction that arn't fitted with them , or at least not visible when the ignition goes on, I've checked as well & they appear not have one,what happens in this case. yes i have noticed this richard and it bugs me too! .....can tell me if the diesel emission limit on the chassis plate has been deliberately removed, is this fail ...or pass and advise...????? Excessively corroded brake hose ferrules still aren't on the system, They MUST be included, they are a common DANGEROUS failure. I have written to you about this before May 20th and since. Brake hose ferrules will be coming back to the manual in the very near future. We have posted about this before. Well you have left it to late to put them back as today I had to manually advise brake hose ferrule ends for being excessively corroded and mark it as dangerous. Try explaining this one to the owner. It' make a mockery of the whole test. You should do the test using the registration number presented with the vehicle, whether a cherished transfer or not. Don't test using the information on the vehicle enquiry service or MOT history service. If the plate is not registered, then you will need to create a new record on the system. These problems sometimes arise if the vehicle owner hasn't informed DVLA that they have purchased a plate. It's the owner's responsibility to apply to DVLA for the cherished transfer. The failure for 2 VIN's will be coming back shortly. Thanks for your comments, you would fail under 1.1.12 stretched or if was fouling it would be damaged. something that is fouling may not be stretched or indeed damaged, Can you clarify what Manual you are getting this from. If it is not in the manual then DVSA would be better stating it is not in the manual. The advice and guidance being given are driving standards down and totally incorrect. There is NO failure in the manual for a brake house fouling, Are DVSA advising testers to make failures up that are not in the manual. You should reject a hose for being excessively damaged or chafed only if it’s severe enough to expose the reinforcement. A brake hose can be fouling and remain undamaged . Another case of making the defect fit the manual which is wrong on many levels and forces us to incorrectly fail an item. You can put the original wording back in the manual the EU directive allows it. simon you try explaining that one to a customer! if its fouling it fouling-not stretched not damaged-fouling!! if they appeal that test they will ask well where does it say on the vt30 fouling as it says damaged but its not damaged its perfectly intact?!! no good leaving it down to interpretation it needs to be crystal clear. no good us putting down the wrong wording so its unclear to the public! DVSA what is going on in your establishment? There are RfRs for a brake hose damaged, chafed, twisted and stretched. These should be sufficient for any circumstance. If a brake hose isn’t damaged, chafed, twisted or stretched why would you want to fail it? I've had the same for a brake hose, as it was deteriorated exposing the construction, it wasn't damaged ,twisted etc , then the failure reasons you've listed doesn't cover it. If a customer wants to be pedantic & argue the issue & they do in the real world, he could say well its not damaged, its deteriorated & since deterioration isn't listed , the argument continues ! A hose should be rejected for cracking or chafing only if it is severe enough to expose the reinforcement. Are you telling us then that the old rfr for a brake hose having insufficient room to move and fouling has been purposely removed from the manual, or is it like a lot of other rfr's that seem to have been "misplaced" but will be making a return? You are correct in thinking this rfr has been removed from the manual and will not be returning. Section 1 of the MOT manual explains several reasons for refusal: https://www.mot-testing.service.gov.uk/documents/manuals/class3457/Section-1-Brakes.html. Julia , it would help us testers as to DVSA's reasoning why they have removed an item that we feel should be still included, you always welcome our input but I feel in some instances its all one way. I see plenty of comments on here with a valid question , but no reply or just a generic pointer to the manual, which is very frustrating. I understand you may not have time to reply to everyone, so perhaps its time for a different platform we can post to & get replies from. If it was fouling part of the vehicle, eg a wheel!! May not be damaged through to reinforcement so cant fail it on damaged, but fouling a wheel is very dangerous and will wear through very quick!! With the greatest of repect lets get someone in that office who has experience carrying out MOT's. The below comment was posted to Steve by Julia, and has been posted numerous times on the blog. we are all aware of the failure in the manual, maybe DVSA could clarify where the reason for rejection appears on the MTS. The failure for headlamps is: 4.1.2 a) The aim of the headlamp is not within limits laid down in the European headlamp requirements and it'is not likely that a vehicle fitted with fitted a right hand dip headlamp would meet these requirements. If there is white light in the ‘red’ area of the screen then the vehicle will fail. There is an RfR for beam 'kick up' which isn't visible on the screen. Therefore, if the vehicle has left-hand drive headlamps and the right-hand ‘kick-up' is not visible on the screen (because they are adjusted too far to the right) then it should be failed. If the aim is too high or too low, it also fails. It is unlikely a headlamp with a right-hand kick-up could meet these requirements, but if it does, it is not going to cause dazzle and therefore passes. Julia is there any possibility even if slight one that you could answer the question that has been asked. you originally stated the following "The failure for headlamps is: 4.1.2 a) The aim of the headlamp is not within limits laid down in the European headlamp requirements and it'is not likely that a vehicle fitted with fitted a right hand dip headlamp would meet these requirements." when challenged as to where this is on the MTS you then totally ignore this and come out with a totally different reason for rejection. Apologies for the delay in replying. Please see the information below about end-outline marker lamps. These are requirements detailed in section 4.2.3. It's not a case of if fitted they must be tested, it’s a case of they must be fitted if more than 2,100mm wide 1st used after 1st April 1991. So missing would fail under 4.2.1 (a). A lamp missing or inoperative. Class 3 vehicles don't need end-outline marker lamps. Have you got a Sun /Snap On DGA ? machine if you have they have got the update wrong after charging loads of money for it and do not seem to have done any thing to fix it. Unless I'm wrong, and I would like to be corrected if I am, but I don't think there is a cut off year for the new plate specific limits, it could be a 2001 vehicle but if plate says 1.1 then that's what you test to. This is something you will need to take up with the manufacturer. Please also see instructions within special notice 6-2018 which is available through 'Special notices' on your home page. The vehicle should be tested against the manufacturer’s plate limit where one is fitted. Unfortunately, there is currently no RfR on MTS for this, but this is being addressed very shortly. If the plate value shown is more onerous than the fast pass limit of 1.5 then the vehicle should be tested to the plate value. Minor defects must be recorded as they are specific defects, although a pass certificate is issued. Advisory comments are subjective and should be used to advise presenters of items worn close to limits. Specific defects and items wearing close to limit should fall into the same category in my opinion. To much for the general public to understand who aren't mechanically minded. Most advisory's are more important than minor defects. Lets just keep it simple ey!Old system was much clearer. Fails and advises, with the option to put dangerous next to either. How many potentially dangerous vehicles are on the roads for another year because of the "omissions" that were made when implementing the new regulations. The EU directive is the minimum standard member states have to abide by but the standard can be raised by individual member states. All these problems were avoidable from the start and would have saved a lot of confusion and frustration if the job had been done properly to start with. "We will be introducing reasons for rejection that have been omitted".............. How about do the job properly the first time round so us testers stand half a chance, very poor showing DVSA. Can someone with hands on mot experience please look at everything again . just tried to fail a car on having left hand drive headlamps in it , and what a surprise its not there !!!!!! We've been looking at feedback received since the new changes were implemented. We will be introducing some reasons for rejection that have been omitted. The rfr associated with beam images incorrect will be brought back when we have done a full review and also updated the manual to align with the changes, along with some others. A special notice will be issued detailing the changes when we're ready to implement them. As the test/inspection manual appears to be constantly changing, when do you suggest NT’s take their annual assessment? If you haven't done it yet this year, I would recommend as soon as possible. And yes, as you point out there will be some minor changes coming - but after the big change of the new manual, it's inevitable some alterations are needed to respond to feedback. A special notice will cover those when made. Had a old mini for test last week the front suspension was sat on the bump stops both sides, looks like its not a part of the test well I say that its not in the manual and nothing to fail it on the mot comp? so had to pass it with a strong advise. how can that be ! so its safe to drive a car with no working suspension ? This item is currently under review to implement. When we have done a full review and also updated the manual to align with the changes, along with some others, a special notice will be issued detailing the changes when we're ready to implement them. The rfrs associated with inappropriate repairs will be brought back when we have done a full review and also updated the manual to align with the changes, along with some others. Is corroded brake hose ferrules hiding somewhere or has it been removed? This is no longer a testable item. We've been looking at feedback received since the new changes were implemented. We will be introducing some reasons for rejection that were omitted. The reason for failure associated with corroded brake hose ferrules will be brought back. Brake hoses are covered under section 1 subsection 1.1.12 of the manuals, defect a and b covers hose reinforcement exposed. So Julia do all the top brass at DVSA assume that a corroded ferule that is likely to burst is safe do they? What about a flexi pipe that has a solid pipe near the end of the caliper is corroded badly? Are we assume these are characterized under the 'rigid brake pipe' section? A bit of clarity is much needed? The manual is clearer to understand in many ways but some rule changes should be highlighted so we are all on the same page? The rfrs associated with ferrules will be brought back when we have done a full review and also updated the manual to align with the changes, along with some others. A bit like MoT Comp. the MTS system messaging service could be better utilized in conveying information. That way, it is guaranteed to reach testers as soon as they log-in. Some of us refuse to use social media! Agree - messaging could be improved. We're looking at being able to send non-special notice type messages in the MOT testing service. We'll let you all know when that's ready. The MoT testing service and inspection manual appear to be in a ‘state of flux’ changing (possibly) on a daily basis. What support then can DVSA offer the professional/expert witness who finds himself requiring to make date-relevant references to the standards that were applied at the time of a particular test? Similarly, what about the tester that may find himself involved in any appeal? Your answers will be very much appreciated. 1st use dates associated with rfr's have not changed, other than the implementation some new rfrs since 20th May. The standards to apply them were detailed in special notice 07-18. Thank you, but that does NOT answer my question. When I test an old Class 4 with single line brakes and I fail it (e.g.) on emergency brake imbalance and/or low parking brake efficiency (as happend recently) why then does it show up on the VT30 as "Axle 1" location? This is something I have no control over. If the vehicle had 3 axles with the parking brake operating on 2 of them, the MOT testing service differentiates the 2 axles with parking brakes associated to them as either Axle 1 or Axle 2. Vehicles with only 1 axle that have a parking brake default to Axle 1. Whilst what DVSA say is correct, I think it's worthwhile pointing out that most, if not all space savers are a different size to the standard road wheels and different sizes across an axle is still fail. The rfr's associated with lamps affecting the operation of others will be brought back when we have done a full review and also updated the manual to align with the changes, along with some others. Apologies we haven't replied before. This has been raised before and similarly for advisories. We are looking at whether this would be possible in the future. We just need to give some thought as to how we present and organise - as effectively all a PRS is, is a very immediate retest. So effectively it becomes a retest on a pass (as a minor or advisory don't fail). So - we are looking, we will let people know as we move it forward. The following have been removed:failure for fitment of a space-saver wheel"
Is this still the case ? as I cant find anything in the manual with regards to a space saver wheel being fitted at the time of the test. Richard, the fitment of a space saver wheel has been removed as a defect. Window tinting is a subjective assessment. However, common sense must prevail, vehicles should only fail if the window is excessively tinted. Note that the requirement is that you can see the obligatory external mirror but you do not need to assess the view through the mirror. Ok the fitment of a space saver is no longer a fail. But if a vehicle is now presented for a test with a space saver fitted , we can fail it for the wrong size tyre on an axle ? At present, a temporary wheel and tyre fitted at the time of the test to a Class 4 is not a fail but should be advised. "c. Tyres on the same axle of different structure -------Major "
"Richard - be careful, these defects only apply to Class 5 & 7"
Would be idea if we had a tint chart printed in shades of white / grey / black (increments of 10%?) to hold behind the glass and given a breakpoint figure where the tint becomes an advisory, a minor & a major fault. Richard, you don't fail a car for space saver wheel fitted never have. However you just refuse to test the vehicle. There would be no justification to refuse to test the vehicle. Space saving wheels are safe to be used on the road - that is what they are for. Stephen you used to fail for a space saver fitted it's the first fail in the old manual. -- RFR 1.
b. a ‘temporary use’ or ‘space-saver’ wheel and tyre fitted as a road wheel. In the pre 19th May testers manual you could fail a vehicle for temporary or space saver wheel being fitted at the time of test. Now you can’t, but you would fail it for different size etc. across an axle unless there were two fitted, then you should get another NT to test and go and have a cup of tea. First time i have come across this since the changes on 20th May,i could not find interaction between lamps i.e indicator effecting position lamp.Has this been removed.Try as a may i could not find it with the search box. several people have asked same question on here eddy, including myself, i ended asking my VE as far as he is aware its still a testable item. but if it isnt in the manual or on our screens we cant fail it?! pass and advise? as normal no response or clarification from dvsa of the changes made. You are correct that the interaction of lamps is no longer in the inspection manual. We have had a number of comments about this and we are looking into it. Could we please have an answer to what we are doing with a vehicle that a light has interaction with another please ? When you change the manual to re-include headlamp image, brake hose ferrules (and anything else you left out) , please make an announcement about it on Twitter and on your mailing list. I am a web developer using the data from the MOT history API, I am not a garage owner. Don't want to miss news of updates. You could sign up to get email alerts from us on subject areas that interest you. You don't have to be a garage owner. We usually announce changes on Twitter as well. how about julia/dvsa when you make ANY changes to the mot test which affects how we conduct a test. you tell us via special notice. not email because who has time to sit and read them during the day and we dont have time to sit on twitter to get updates. you set up this method of communication which does work well-why not use it? Good point, I don't use social media & I don't always pick up or receive emails straight away. Special notices have been & should be the default method of notifying us as to any changes etc. We do - for 'instructive' changes we always do a special notice. However we also often supplement them with blogs, Twitter and other channels which will get to other interested people which give a bit more background. We try and keep the special notices short and simple to explain what is changing. the mot comp and test is for us testers so would it not be a good idea to inform us testers first of any unjust and sudden changes that you ( dvsa) decide to make via the special notice function?todays technology and the system we use allows for immediate updates as they happen. we all cant/wont be able check social media for any changes before or after we do a test..yes? dont focus on what the public would like to hear and tell us instead what we want to hear. same here david im signed up to the email alerts which says would notify us of major updates to the mot system, but yet again its a system brought in by dvsa which doesnt get used or used in the right way.